Thanks for checking out my services! My name's Ish--college English professor by day, interstellar copywriter by night. The written word is my one true love (don't tell my wife!). I've been a writer at heart since as early as I can remember, I've been teaching writing for nearly a decade, and I've been content manager of a blog for the college that I teach at for about five years. 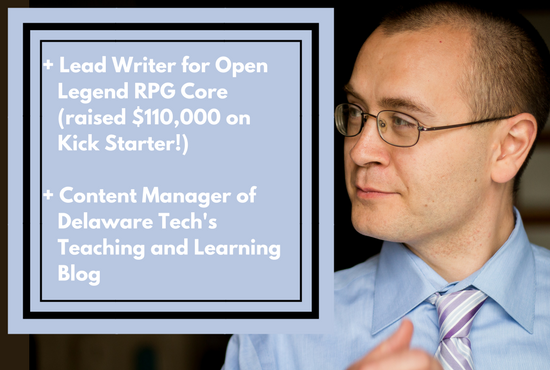 What's more, I was the lead writer and editor for a table top roleplaying game that raised more than $100,000 on Kickstarter (just Google "Open Legend RPG" and you'll see what I'm talking about). I've also launched my own e-commerce, affiliate marketing, and local lead gen sites, and I'm a happy member of Superstar Academy. So I don't just know how to write. I know SEO. Whether you need blog posts, sales copy, website content, or more--I can take care of you. So take a look at what I have to offer, and don't hesitate to touch base if you've got any questions at all.